Wow! So we have had a few injuries here and there lately but nothing like this week where we are all scrambling to check our bench cover or the best player option. This is why we make sure we build a handy bench with guys that cover for you. I talked about it a bit last week, but I wasn’t thinking that we would be seriously looking at it hard this week! Now I didn’t put it out there asking for questions as I was fairly confident in what I was going to get back, so I will have a look at what to do with some of these guys and a few other bits and pieces as we Scramble our way through Friday! So last night we had the options of…. What? Hang On? We didn’t have one? Just as I was starting to get used to having these games. But yes it is true we have no more of them this year. But I think the AFL will slide a few more in next season as they seem to be rating fairly well from what I understand. I know that a lot of fantasy coaches won’t be too happy about that but hey, just like we did with the substitutes, we will all adjust if it becomes the new normal. Carnage all over the place! I don’t mind if we have one LTI in a week but to have two and then two other guys going down that are on a lot of fields (well at least one was) that just makes things bloody difficult! So I will have a quick look at my thoughts on what to do with some of these guys. I am going to focus on AF pricing here as it is what the majority of people play but they probably won’t be massively different options in the other forms. Nic Nat. Firstly this is shattering for the big fella as he damaged his knee that wasn’t already reconstructed! But for us Fantasy Coaches we can’t dwell on this and we have to find someone to fill the spot this week. The biggest problem with Nic is that he isn’t priced very highly and we are struggling for a quality ruck around that price point. At his price you need $120k to get up to Goldstein and more than that to get to one of the big three. If you are tight on cash you can go $30k up to Nank or just $7k to get to Jacobs. If you have no cash then your only options are Bellchambers or Lycett. I am a bit nervous on what Bellchambers will do and also Lycett. If you have the cash then Nank is definitely your man and if you can’t quite get to him then I guess Jacobs is where you go next (caveat: I have traded him out at his bye and hence he should have a huge finish to the season). James Sicily. Wow, this one really hurts, he has been a very popular selection this season and after those two early suspensions he has been great. If you have him down back then for me the players that I would target based on how much cash you have would be Lloyd or Angus Brayshaw. I really like both of them and Brayshaw is most likely to come into my side due to him getting more mid time now and he is $10k cheaper! If you don’t have the cash to get to them Whitfield or T Macdonald are the ones that I would look to. Up forward then you can pick anyone for less cash than Sicily other than Devon Smith, Westhoff, Dangerfield or Menegola. So really there are plenty of options. But if you have $15k then I would be going up to Dangerfield. But if you have to go down then go to Rocky, Wingard or Heeney. Paddy Ryder looks like he will only be out for one or maybe two weeks. Now being a ruck we don’t tend to have much in the way of backup. So if you do have some cover you could keep him and address other issues, but in AF you can certainly trade him out as you are more likely to have cover on the other lines. In RDT and SC then you may need to just be wary of the number of trades you have before making a big decision. At this time of year I like to keep trades when I have less than 3 for season ending injuries. Good question there Gav. Look for me I don’t think it is an issue. He has averaged 102 so far this season and in the 5 week period earlier this year when Ryder was out with his achilies injury he averaged 99.6 (in Supercoach he averaged 106.8 over those 5 weeks which was 3.4 more than his full season average) . So really it shouldn’t hurt too much. What it does mean is that he will be around the ball more as he will play in the ruck more. With Rocky I don’t think it will make any difference. He isn’t getting as many of his points from sharking hitouts, he has been getting them in general play (from what I am seeing anyway). Westhoff or Danger? Surely Danger goes big with the run home. I really want to say Danger here just given his history and what we know he is capable of but when you look at the numbers they are both averaging 102 for the season so far. If you have a look at the Scale of Hardness then the decision is Westhoff. I think he is going to be more consistent but you never know with Danger, he can have another 150 or he can have a 75. This is an extremely close call and if I had to make it I think I go Westhoff at this point just because of his role at the moment. Just the highlights this week on the ones that are fantasy relevant. Jimmy Webster misses again through injury with a groin issue. They say 1-2 weeks, I think hold at this point if you have good cover. Sam Murray has been named!! And not extended bench this time! Darcy Cameron finally gets a game. This is a concern for those that are using him as a captain loophole in Supercoach! Michael Hibberd is out (is this a blessing in disguise). If I had enough trades in RDT and SC he would be out and if I didn’t have other issues in AF he would also be gone! Word is that he is only out for one hopefully so I am holding for now. Joel Smith comes in to cover for him so that means most of us should have cover. Kreuzer is being managed. Hopefully this means just the one week. Perhaps Darcy in might just be the thing Kreuzer owners need! Robbie Gray has been named. Kenny seems to think he is ok to play. I am a touch sceptical, I think he is a huge risk to be a late out, so I would make sure that I have cover for him. Don’t forget to set your emergencies. As we get deeper into the season they become more critical. In SC and RDT I would be loathed to go under 3 trades with this much time left in the season. If you are covering a one week injury then I would try and hold and use your bench. Who knows what the next few weeks will throw at us. Check your opponents if you are just playing for leagues. You may not need to trade and can take a donut if they have as many or more issues than you! 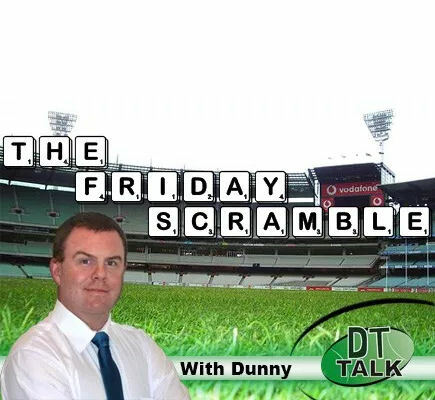 Well I hope everyone that went to the DTTalk night in Melbourne had a great time last night. I am sure there is a hang over or two around the place this morning (I am looking at you Calvin) but I am sure that if it was anything like the one in Adelaide it was a fantastic night with a heap of laughs and frothys. Have a great weekend and hopefully we don’t cop any more injuries this week. Catch you all next week! Cheers Dunny!! If Gray is a late out, would you expect Rocky or Wingards output to drop as they may get rotated through the FWD line for extended periods? I’m hoping it means Wingard goes forward and Rocky more mid. Wingard actually said he is expecting to play more forward if Gray is out. Ahern moves from M8 to fwd emergency, oriordan/smith/mihocek to D6 (only rookie on field) – thoughts? Which one gets traded to Danger? Not Rocky. I went Menegola. Still unsure about McLean though. Are they really your worst 3 forward? Yeah fwd line is D.Smith, Westhoff, Heeney, Menegola, McLean and Rocky. Rockliff’s last 5 average is 98, Menegola’s is 94. Danger’s (thanks to his one-fitty last week) is 101. I’d say Menegola but it’s a crap shoot. … and everyone jumps on the Danger-train. Not convinced myself. Apart from that massive score last week (against the team he loves to play the most) his form isn’t top six imo. Happy to be proved wrong, but I’ll wait a bit and see how he goes. Just had dinner with some fellow fantasy tragics … and my views on Danger were well and truly howled down! Easy trades for me this week. Ridley –> O’Riordan and Sicily –> Laird. That will leave me enough to go Doedee to Heeney next week and have my forwards, defenders and rucks “completed”. Thanks for all your efforts throughout the season – always a great read!! Hope you can regenerate it again next year?? If I was doing this trade, it doesn’t matter. Whoever you trade out is, by the law of fantasy, going to go 100+. Yeah Sicily and NicNat screwed me with some of the other issues I have in my team. Cant remember ever having a worse season than this with injuries. I seem to have picked them all and we probably get my worst ranking ever. Sidey/Sicily to Laird/Shuey leaving $147k, benched NicNat for BigO for 1 week whilst getting cash for Grundy next week. Same issue as you Grover, having both Sic and NicNat. Seems as if you had more cash to play with, cause I downgraded to bring in Stef. I couldn’t reach Laird or Grundy, so figured BigO (bench w/Cameron) is only good for 50 odd, ruck therefore my pressing issue. Got cash in the bank for next week…Parker gets another reprieve, but surely he can ton up vs GC. Grundy you’d expect to drop in price to grab next week also!!! I’ve been contemplating a similar move with Sidey/Shuey GG, especially with a tag likely for Steele this week and Eagles playing the Dogs, but I just couldn’t see Shuey staying at my M8 for the rest of the season. Traded out Sicily to Morgan giving me 344k to bring in Macrae and Grundy next week for Telly and Witts..
Who do you reckon is going to tag Sidebum, Alan? Jacobs isn’t playing so I don’t reckon it’s a concern. Someone might take on a run-with role on him but they don’t have another bona fide tagger do they? My current plan is Fritsch + Sicily for Dangerfield and Brayshaw, but this only leaves me with about $11k. Is it worth downgrading one of these and fielding either Burton or Ahern, and then loading up next week? How important is cash generation at this stage of the year? Totally depends on your team overall Nick. You can’t do much better than your suggested trades, esp on the basis now that Danger will/is a top 6 forward. Both have low BE, so neither will be dropping in price next week either. I think pull the trigger this week, seems teams are bringing in rooks for the tail end of the season or through injury, so if you need to downgrade next week, looks as if there’s plenty of opportunities. Similar to what Nostro said.. These 2 are definitely worth draining the bank for.. At this stage of the year, cash is important, but only if it allows you to get in Uber players like Laird/Brayshaw..
As example, I’m playing O’Riordan this week (Sicily to Morgan) because I couldn’t afford Simpson, and I’m not yet sold on Hurley/Crisp over Kade, so banked the cash for a double upgrade next week. Thanks, both – this makes sense. I’m a bit concerned about having Burton and McInerney (and to a lesser extent Ahern) sitting on the bench, as they are really only going to lose money from here. But I think I’ll stick with these trades, and luck permitting look to bring new blood in the following weeks (noting that their scope of cash generation then is more limited). Ahern’s scoring pretty consistently – average 71. And with a BE of 21 he’ll still be making cash. Grundy and Hurn or Martin and Brayshaw? That’s a very good question. I reckon if you took a poll of 100 peeps, it’d come out roughly 50/50. I tend to like option 1 – getting in Grundy….other than his low score last week, he’s been supreme all year! Need to trade Sicily out and can get any defender I want (already have Laird, Lloyd, Whitfield, Brayshaw and Yeo). I am bias, but I love Hurn this year. I have had him since round 2 and he has been dam consistent, few low scores here and there but everyone has those. Stuck with my trades this week. Have Sicily and Fristch to drop. Fritsch I have $600K to spend, who is the best option? Rank 108 so hoping for the best FWD score this week to get into the top 100! Tough choice Kingzy. You could throw in Hoges, Hawk, Lambert, Mundy and even Riewoldt as other options with low ownership that could play a 100+ game.. Probably Buddy or Billings, but if you wanted that POD then maybe Mundy. Yea there are a few to choose from. I could get Buddy for a 1 game point grab, then trade him for Danger next week. Prefer to get someone that I can hold for 2 weeks, and get Neale – Macrae next week. Menegola hands down kingzy, good luck I’m still ranked in the 100’000’s lol even though I think I’m a novice fantasy player I am still pretty crap. Sorry I couldn’t log in this morning , my Mum wouldn’t give me the password as I’ve been a naughty little poopy pants. Guess Im not aloud to have sleepovers anymore and using my dads socks. R17 traded Crozier to Sicily due to injury. R18 trading in Crozier from Sicily due to injury. Cash allows me to go: Seb Ross -> Macrae. What will Darcy Cameron score this weekend? 60-80 id say, hard to say though. Has been racking up big numbers in the magoos but will have to share ruck duties with Sinclair. Hoping he scores well as I have him on the field with Nic Nat on the bench this week. Devon: more likely to go big & has through the roof tackle numbers. Pretty consistent the whole year & he gets to feast on Freo carcass this week..
T.Sheridan, S.Murray or K.Kolodjashnij to have on field? Bring in Macrae or Gaff?? Which will be better do you think? Option 1 is Sicily to Ryan, Rocky to Macrae. Doesn’t sound like you need any advice whatsoever! And with 7 trades still: you’re flying!!! Well, given you have assessed that Billing’s is a ‘punt’, I reckon a very reasonable punt, given his form since returning to the team.is right on 100 over 4 week’s. Also the saints are playing a more determined fantasy productive game sine the shake up a month ago, so there is some contextual support you might argue Billings is also benefiting from. Assuming your available cash, or current forward inclusions, rules out Heeney, Wingard and McLean as options? Didn’t read your team below. So, if cash available, Wingard the other suggested option, perhaps even preferable option. O’Riordan is vs GC this week if that helps in your decision. Anyone know what kind of impact Darcy Cameron’s inclusion will have on Sinclair’s score ? Big potential to affect Sinclairs score IMO. Cameron is a ruck, as in not known for primary a fwd role like some other “ruck rookies” can. That indicates at the very least ruck rotation to the fwd line. So Id invisage potentially more fwd time for Siclair. That usually means lower scores (he could always snag a few extra goals). Kelly > McCrae (regardless of the unsubstantiated injury reports, he didn’t look right in his last game. I reckon McCrae will get close to his BE this week. Hes a gun). 2. Macrae for Redden next week. Is there any injury concerns to josh kelly still, I know he’s named but I hear rumours. Hoping Fergus Greene makes the cut – if so, will be the first time I’ll have all 30 players playing this year. Even in rounds 1–2, only had 29/30 playing due to Cameron at R2. With only 6 rounds remaining and cash becoming limited should I be trading in a bench player like Morgan with a low breakeven or save $30k and try Lienert? Wondering if Whitfield will cop a tag this week? Would love to get him but worried about Rocky shutting him down? Or would someone else, like Kelly, be more likely to cop the tag? Put Grey on the fwd bench so have Guulfi and Ronke playing 90/82 vs 25 (injured) but I have more confidence in the to younguns.. valid or am i stupid and get Grey on the pitch? Upgrading J. Higgins to a premium mid at M8 should I go Beams or Z. Merret?